In the pale, cold light of dawn, the silhouette of a mighty mountain emerges from a sea of rolling mist. The peak with the cross marking its summit towers majestically over the Alps. From a bird’s-eye perspective, the winter landscape appears like a magnificent painting that lets the observer forget the cold, harsh climate. Far away in the distance, a tiny dot can be made out soaring among the mountain peaks. A piercing cry that sends a chill to the bone, announces the presence of a young golden eagle even before he has properly come into view. For an instant, the bird seems to hover in the air. The tips of his powerful wings point to the skies as the elegant eagle rides the upwind, gliding ever-nearer. Finally, and almost silently, he lands on a mountain ridge. The howling wind that sweeps through the mountain peaks drives millions of snow crystals over the ridge of the mountain, powdering the brown and black feathers of the golden eagle white. Far below in the valley lies a seemingly still and peaceful world. But it is not the eagle’s world. A long journey lies behind the young bird. Driven out of his own territory by others of his species, he has come this far and has now reached his limits. Can the world down there in the valley offer him a future? Only one in five young eagles survives its first winter. This film tells his story. In spring, two eggs belonging to a pair of golden eagles hatch in a nest in a rocky crag in the Alps; first one, then the other. Like most young animals, the two fluffy, white chicks are helpless and completely dependent upon their parents. But already during their first days of life, a power struggle rages between them for superiority and dominance. The parents tend to only feed the eaglet that demands to be fed loudly and most insistently. The older, stronger offspring pecks at its sibling, pushing it away from the food so the younger, weaker chick is often left with nothing. 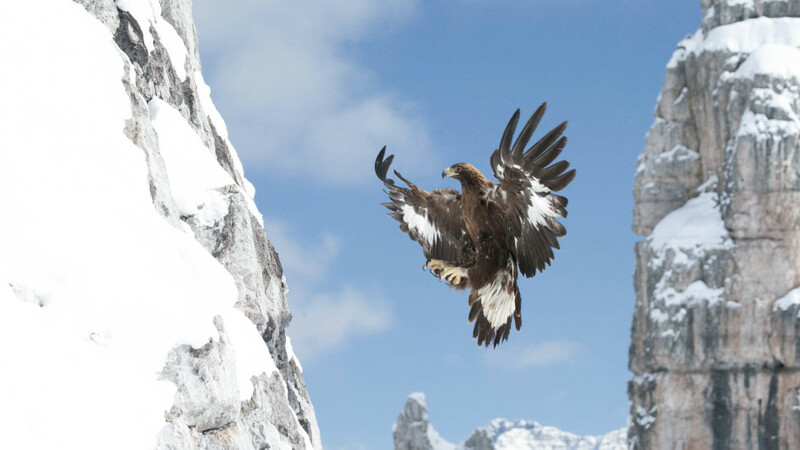 The two adult golden eagles are also pushed to their limits – having to prove their success as hunters almost every day. Their young are always hungry and constantly demand food. Only in years where there is a plentiful supply of food and the hunters are lucky will both eaglets survive the first few weeks and months. But not in this case: Only one of the young birds survives. How will he cope in his first winter in the harsh Alpine environment? This is a story full of dramatic twists and turns, in a spectacular, fairy-tale landscape with mountain dwellers that include foxes, marmots, mountain hares, crows, chamois and stags, covering the life of a young golden eagle as he grows from a pushy young bird, who has just learned to fly, to a magnificent king of the skies.